Wonderful composition mate well done. Must visit this place one day! So Africa so HOME for me personally as I am still a Kenyan even though I live in Australia now made me very homesick and wanting more. Encourages me to keep going with our Rotary projects for endangered species. I'm sitting in my office in suburban Warrenville, Illinois, and yet, this image transports me to a part of the world so far removed from what I can imagine. What you've captured in that photo might as well be on a different planet compared to suburban northeastern Illinois. A stunning photo, as always. Keep up the great work! Very nice. So different from the usual photographs when size of the elephant is emphasised by using a low angle. Here, such a huge creature is dwarfed by a magnificent ancient tree. Even the termite mound made tiny little critters dwarfs the elephant. Distant view of the river gives the viewer a sense of the place where the photograph was taken. Neat. I love this photo precisely because it is about so much more than the elephant. 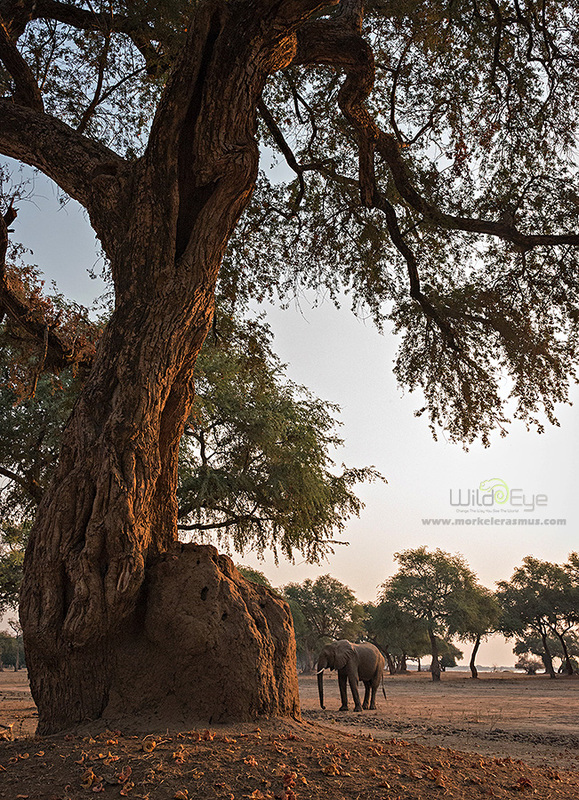 The world's largest and most enigmatic mammal, dwarfed by a beautiful tree; such a shame that the trees and the still plants are often overlooked when so often they transform a composition. Brilliant photography, I will definitely be following. Elephant seems like a pet ! I 'd love to have one of these in my little garden !